IMX MatrixCloud Middleware Management Server - MatrixStream Technologies, Inc.
MatrixStream M2200 middlware server is the brain behind MatrixCloud IPTV ecosystem. Working together with other MatrixStream servers, the M2200 middleware server manages users, viewing rights, TV packages, and much more. Manages live streams from IMX e4090 video processors. 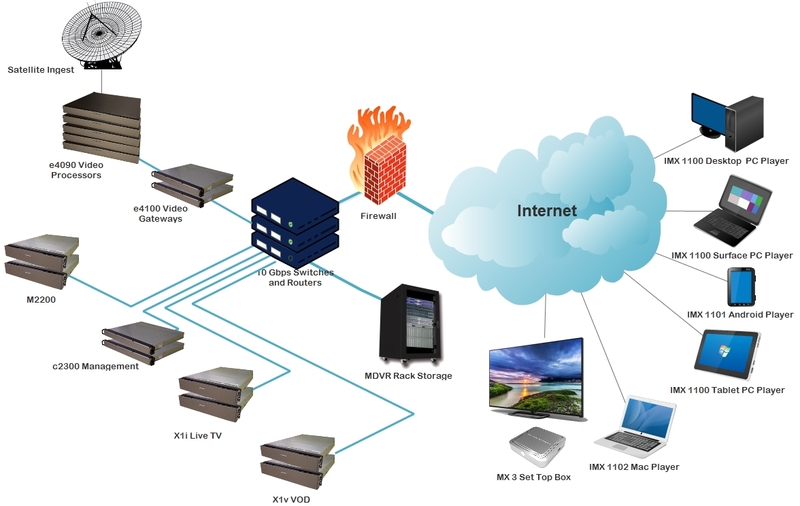 Next Generation IMX Video On Demand (VOD) Technology – Works with any broadband network. The IMX platform automatically works over any “best effort” broadband network without any loss of video quality during viewing. Internet HD Streaming Support – The IMX MatrixCast Streaming system is designed to work over the Internet. WIMAX Support – The IMX VOD system can deliver videos efficiently over IP networks such as WIMAX without QoS or guaranteed bandwidth. External Storage Support – Fully capable of interfacing with an external SAN (Storage Area Network) or RAID storage farm for video storage. Unlimited User Support – All service provider servers can expand linearly in an N+1 cluster. Personalized EPG (Electronic Program Guide) – Viewers can create their own customized Electronic Program Guide to suit their individual tastes. Conditional Access – Allows management of all TV Set Top Box (STB) and PC players. Full Backend Web-Based VOD Management -Allows management of all VOD content, including videos, channels, users, ads, previews, reports. Multilingual Compatibility – All STB/PC/Backend management has multilingual support (including Japanese or Chinese). OSD/VCR Functionality – The MX 1 IP STB has a full On-Screen Display (OSD) to support VCR functions such as fast forward, rewind, stop, pause, and a DVD-like chapter menu. Autoprovisioning Capability – Both the STB and PC have auto-provisioning capabilities for automatic user setup. Remote Software/Firmware Update – The STB/PC has remote software/firmware update capability to minimize truck rolls. Parental Controls – Parental controls are available that allow you to create password-based locks for adult-oriented programming. Advanced Video Codec Support – The system can easily support existing and future advanced video codecs using MatrixStream’s patented MatrixCast streaming platform.